It’s already hot in my part of the world and we also started getting mangoes in Little India. This post is about how to make maanga vathal / dried mango for cooking purpose. This was done last year in Chennai and its still fresh. Time to make a fresh batch again!!! 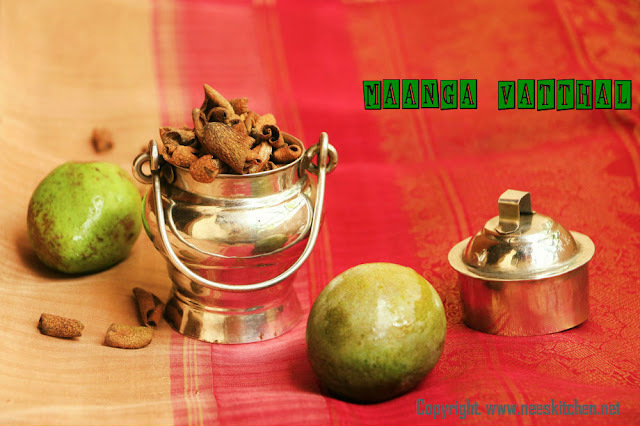 Pin: https://www.pinterest.com/pin/402931497893870494/Summer is the only time in which we can prepare all vathal’s and one of my favorite is maanga vathal (dried mango). We get mangoes only during summer season however we use them in our cooking throughout the year. Chennai is the best place for me to sun dry as we have ample space in my mother’s apartment to dry vathal’s. I use these vathal’s in milagu kulambu and during non-mango season I put them in dhal also. I make amchur powder with these vathal’s whenever I need, it tastes good and gives me a satisfaction as it is homemade. 1. Wash and cut the mangoes into cubes ,removing the seeds. If the middle portion is harder you need to remove that also. 2. Add salt & turmeric and mix well and marinate on day 1. 3. On day 2, mix the mangoes again by shaking the vessel. By this time you must see the water been formed. 4. On day 3, strain the water and dry both the water and mangoes in sun. 5. At the end of day 3, around evening time, mix the water and the mangoes and leave it overnight. Repeat this process until the water is almost empty. 6. Once the water is emptied, sun dry the mangoes until they turn black and crisper when sun drying. The crispness will go after a day which is fine. 7. Maanga vathal is ready to be used in milagu kulambu, dhal etc. 2. Mangoes must be soar. 3. I don’t prefer it to be too salty hence you may adjust the salt taste. Maanga vathal is ready to be used in milagu kulambu, dhal etc.